US airport security authorities are planning a rethink of controversial new body scanning procedures after a storm of protest on the internet - but only for pilots. Transportation Security Agency (TSA) administrator John Pistole announced on Tuesday that the agency would be "announcing some new policies" in the "near future". These are expected to change the screening process for pilots - but TSA sources warned IT news site CNet not to expect any major changes in procedures that affect the general public. Pilots have protested at the current regime, which involves them being forced to choose between a full body scan or an invasive pat-down a few minutes before they fly. The TSA's new plans may include the use of a biometric ID card that will enable pilots to bypass screening at busy airports. The use of body scanning technology has been greeted with a widespread backlash on the internet. Tech blog Gizmodo published a series of 100 bodyscan images leaked from a Florida courthouse, where security staff are not legally allowed to store images at all. Elsewhere, news aggregator The Drudge Report condemned new airport security procedures, posting a photograph of a nun being patted down by security staff under the caption, "THE TERRORISTS HAVE WON." Other protestors have posted videos on YouTube, including reports of a screaming three-year-old girl being manhandled by airport staff. Californian software engineer John Tyner became an internet viral sensation after posting videos on his blog of his refusal to allow security staff to touch his crotch with the line, "If you touch my junk, I'll have you arrested." 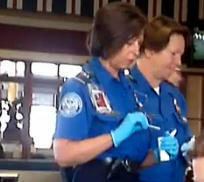 Tyner was flying from San Diego on a hunting trip on 13th November when security staff approached him for a spot check. He declined, later accusing them of attempted sexual assault. Wags looking for trouble when they next fly to the US can get their "Don't Touch My Junk!" T-shirt here. And this tells the full body-scan story in all its gory glory.